This battery has delivered good starting performance in all weathers. The bike had an enforced layup this spring because I had a hand injury and I forgot to connect my trickle charger so I was impressed to find several months later that it still held a good charge. Good lower cost option to the original Yuasa. The original lasted less than a year and is only covered under warranty for six months! Purchased as upgrade for Piaggio LX 125 2006 Model. The later fuel injected scoots use a 10amp but the older ones use 9 amp. Decided whats good for the latest models is good for the old. You will have to remove the little battery box on the Little Vespa but this larger battery will fit snugly. The Terminals are in the correct position for the scoot also so no issue with cables not reaching. Despite the old 9amp battery holding full charge it would not fire up. However fitting this upgrade battery it started first time. No More filling and again after fitting a charge indicator with charge connector i never have to remove the battery. Certainly not cheap but a quality item. Goods as described on-line. Packed well and delivered as ordered. 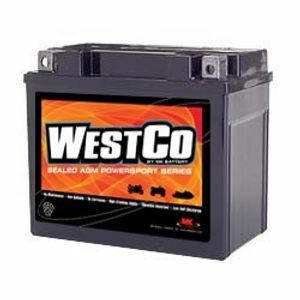 Very straight forward web site, easily located the correct battery for my motorbike. Payment straightforward and safe (using the bank system of PIN code access). Did not fit my 2000 Fzs600 and had to return it at my cost. The customer services chap I spoke to was unfortunately unhelpful, refusing to take on board any of my comments or update the battery fitment guide. Took 2 weeks and prompting to get a refund. An unpleasant experience with Tayna which didn't necessarily have to be. Make sure the battery fits. Good battery - worked straight out of he box - no funny business with liquids etc. Not yet used, fast delivery. It is to power my Fishfinder, rather than lug a car battery around. Also half the price of the unit the makers supply. quick delivery and very easy to fit. Trickle charged for a few hours,then fitted in sub-zero temperatures. The old girl fired immediately,despite not having run for weeks(as the original fitment battery was knackered). A great improvement in cranking with the AGM battery! Only had the battery fitted for a couple of weeks so dont have a long term opinion. The battery arrived the day after ordering and took only minutes to fit, no assembly, no filling, no charging, straight out of the box, job done. Engine cranks with plenty of power and voltage remains high at rest. The battery was promptly shipped and arrived quickly. Excellent service, once again! Good product & quick delivery. So far so good. Fitted fine, arrived fully charged. I won't really know until mid-winter!